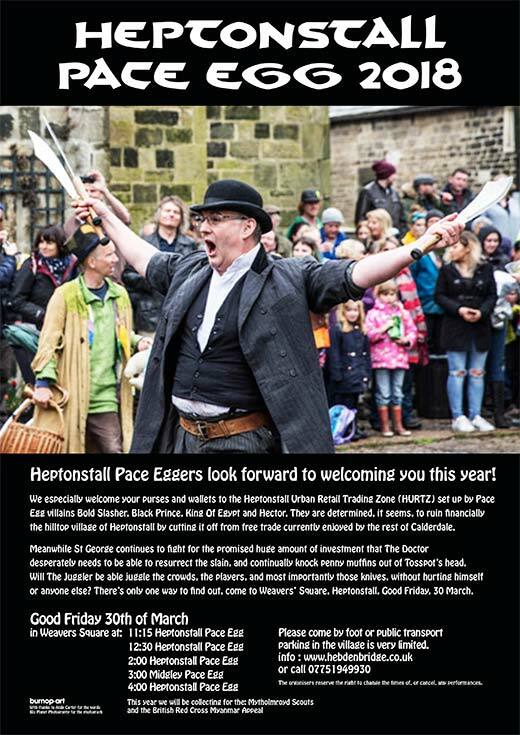 The Heptonstall Pace Eggers look forward to welcoming you this year! This year's Poster states, "They especially welcome your purses and wallets to the Heptonstall Urban Retail Trading Zone (HURTZ) set up by Pace Egg villains Bold Slasher, Black Prince, King of Egypt and Hector. They are determined, it seems, to ruin financially the hilltop village of Heptonstall by cutting it off from free trade currently enjoyed by the rest of Calderdale. "Meanwhile, St George continues to fight for the promised huge amount of investment that The Doctor desperately needs to be able to resurrect the slain and continually knock penny muffins out of Tosspot’s head. "Will The Juggler be able juggle the crowds, the players and most importantly those knives, without hurting himself or anyone else? There's only one way to find out. 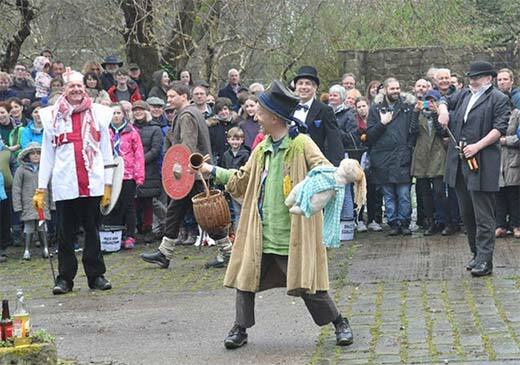 Come to Weavers’ Square, Heptonstall on Good Friday, 30 March." and the British Red Cross Myanmar Appeal. Parking in the village is very limited. "It’s said to be the oldest drama in the world, dating back to ancient Egypt and performed by many civilisations across the centuries. 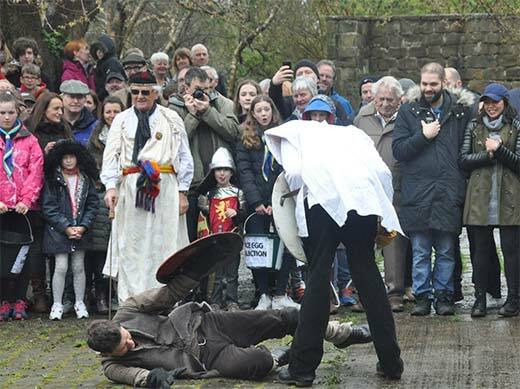 "Now the Pace Egg Play is confined largely to the Calder Valley where it has become an established tradition, played out in all its gory glory on Good Friday.